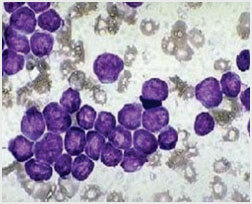 Acute Myeloid Leukaemia is one of the most common types of leukaemia. Persons with AML are more likely to have infections and have an increased risk for bleeding as the number of healthy blood cells decreases. Umbilical cord blood transplantation in childhood AML is a therapeutic option for treatment. The National Comprehensive Cancer Network (NCCN) announced updates in the Clinical Practice Guidelines in Oncology for AML to include umbilical cord blood as an official stem cell treatment option in October 19, 2009.